Geotab is an open fleet management software designed to give you total control of your fleet and its inventory and ensure that your business operates in compliance with prevailing industry standards, practices, and policies. The software offers users with a scalable option that they can tailor to suit their existing workflows, systems, and setup, making adoption and implementation easy and simple. Geotab provides companies with a string of products and technologies that allow drivers to effectively manage their logs and ensure their safety by monitoring their hours and fatigue levels. Geotab also offers a BYOD (Bring Your Own Device) functionality, enabling drivers to integrate their iOS or Android device into the system and create driver applications through Geotab’s open APIs and SDK. Fleet management need not be a complicated prospect. With Geotab, companies with fleets now have a user-friendly platform that helps them adhere to compliance and safety standards via proper fleet governance and maintenance, driver safety, and inventory management among others. Geotab comes with all the functionalities and features that help you satisfy the regulations for electronic logging devices (ELDs). Drivers can log reports and enter vehicle inspection data with just one, unified solution. Management can schedule repair and maintenance for their trucks without disrupting their schedules and other facets of their operations. The software also comes with the Hours of Service (HOS) functionality that keeps the management updated of the hours rendered by their drivers, enabling them to balance rest and work while keeping fatigued drivers off the road. Geotab helps companies to effectively manage their drivers and ensure their safety and that of others. Drivers who are suffering from work-related stress and fatigue are prone to vehicular accidents. As logs are entered electronically and stored into the system almost immediately, Geotab helps in decreasing administration expenses. Your trucks are all in good condition and your drivers are energetic and well rested. This results in better vehicle efficiency and driver safety. Violations are significantly reduced, which means very high CSA safety ratings. 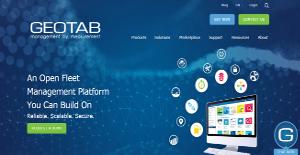 If you are considering Geotab it could also be sensible to analyze other subcategories of Best Business Process Management Software listed in our database of SaaS software reviews. Every enterprise has its own characteristics, and might call for a particular type of Business Process Management Software solution that will be designed for their business size, type of clients and employees and even particular industry they cater to. It's not wise to count on getting a perfect services that is going to be suitable for each business regardless of their background is. It may be a good idea to read a few Geotab reviews first and even then you should keep in mind what the service is supposed to do for your business and your workers. Do you need a simple and intuitive app with only basic functions? Will you really make use of the complex functionalities needed by pros and large enterprises? Are there any specific features that are especially beneficial for the industry you work in? If you ask yourself these questions it will be much easier to get a solid solution that will fit your budget. How Much Does Geotab Cost? Contact Geotab for enterprise pricing information and other product details. You can also submit a request for a demo to see if the software is a perfect fit for your business. We realize that when you make a decision to buy Business Process Management Software it’s important not only to see how experts evaluate it in their reviews, but also to find out if the real people and companies that buy it are actually satisfied with the product. That’s why we’ve created our behavior-based Customer Satisfaction Algorithm™ that gathers customer reviews, comments and Geotab reviews across a wide range of social media sites. The data is then presented in an easy to digest form showing how many people had positive and negative experience with Geotab. With that information at hand you should be equipped to make an informed buying decision that you won’t regret. What are Geotab pricing details? What integrations are available for Geotab? If you need more information about Geotab or you simply have a question let us know what you need and we’ll forward your request directly to the vendor.